After discovering certain websites were taking forever to load - slower than molasses! - and thinking it was my internet connection, I moved on to troubleshoot all the computers in my house. It was just mine. So I then began troubleshooting all my extensions in Chrome, I discovered Evernote web clipper was the culprit. I would load the same page in Safari (which did not have the Evernote webclipper installed) and the same website page would load fast and fine. I have disabled my clipper for now Please fix this issue pronto! Thank you! I've lost countless hours because of this web clipper malfunction, pasting links from chrome to edge at first so I could use the web clipper there and then trying to find a permanent fix. How ironic if you consider this is supposed to be a productivity tool. I believe in response to the Chrome changes, vicious circle. This is incorrect, misinformation spread by @gazumped. Clipper keeps asking me to reload pages; can't clip at all. I'm in Chrome Version 65.0.3325.181, on Mac. Clipper entirely stopped working after the update to 7.1. Don't know what to do anymore!! Chrome Version 65.0.3325.181, Windows 7. IMO, no one should state this rumor unless they have a referenceable quote from Evernote. Really? Where in that quote does it say that the Evernote Clipper was broke by a Chrome update, and the Evernote was forced to release a new version???? Web Clipper for Chrome in Windows is not working for me at all. Clicking on the elephant icon does nothing now. I reinstalled it and still not working. I think I read somewhat that the recent version of Chrome has created some issues with the clipper. That may be true but also the web clipper itself was updated yesterday. I noticed that the "remarks" feature in the web clipper is gone on chrome. This is a huge loss. Any update on what happened and how this might be resolved would be appreciated. I've attached a screenshot of chrome without remarks and safari that has the remarks. I'm having a similar problem with the web clipper for Google Chrome. I can clip pages, but it is not possible to leave any remarks. The default notebook is not coming up, and instead of being able to quickly select another notebook with the keyboard by typing a letter, I have to scroll through all the notebooks. I also observe that web clipper for Chrome has stopped working. Same here. The clipper is dead on arrival. I might as well leave the internet altogether if I don't have my clipper. Ok, enough whining. Please Fix ASAP. And yes, scrolling down all notebooks is far from ideal or useful - who in EN was so genius as to remove the previous functionality?? They are 'sort of' responding on Twitter saying they are "aware of" the issue, which was what they said when Presentation Mode was removed in January...of 2017. We need to focus on the positive. Their promos asking people to upgrade from Premium to Business appear to work splendidly. I'm not going to tell another customer how to cope, but I draw nothing positive from the fact that a promo works for a more expensive product I don't need. Why doesn't the web clipper work? If one can guess anything in this fog of confusion, it's that Evernote does not consider its regular customers a priority. Presentation Mode, Evernote Food (which I used), etc., were not core features. 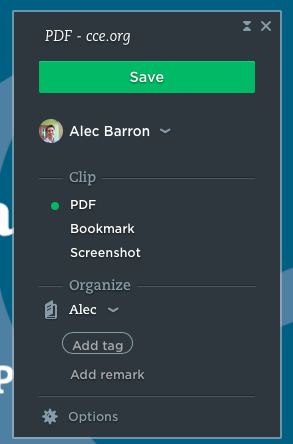 If Evernote didn't see the negative reaction coming to removing so many features from the Chrome web clipper, then it doesn't know its customers very well and that is disturbing. I've gone through Twitter and seen messages several days old that reported problems. As discussed before, we shouldn't have had to stumble upon this, we should have been notified with a full explanation. It is very important to manage customers' expectations. I'm not being pedantic, it's what I'm used to from my interactions with other companies that had excellent customer service. I have no idea why some people in this forum are expecting the rest of us to take solely on their uninformed say-so that this situation was both unpreventable and that Evernote is doing its best to fix the clipper. How are we supposed to know that? What happened? How did it happen? What is the time frame for resolving these issues? Days? Weeks? Longer? It's hard to believe they have no idea. Lastly, we are not developers, we are not relatives of the CEO, we are customers, many of long-standing, and many of us pay for the service. We have every right to be unhappy about the problem and how it is being handled. It's partly a trust issue now. I've used Evernote forever and individual customers haven't appeared to be a priority for ~three years as that's when they started scaling back features and dropped customer support. Either they are getting arrogant and figure if Apple doesn't need to offer customer support, they don't either or they are eying companies like Dropbox and Pinterest who are going to IPO for more money than any of us imagine and getting ready by cutting internal costs to look better for investors. The good part of this is they are a subscription service so customers can walk away if they don't get things in order. The bad news is that I don't know if a good replacement (though wouldn't be surprised if something comes out in future months). I'm sorry for not realizing you were joking. Humor is sometimes hard to detect on the web, and there are a few people in this thread who have been very protective of the company. 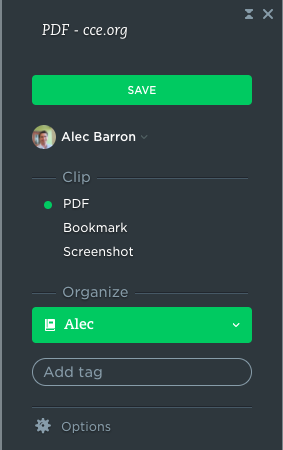 I, too, have used Evernote for a long time and the web clipper is very important to me. I have looked at substitutes but haven't found anything that worked as well and given my huge number of notes I'd rather stay if at all possible. But it may not. I've also considered that EN has scaled back in an attempt to appear more attractive to investors but that's a misguided strategy. Unhappy customers, disorganization, and poor communication are not traits that send investors flocking to companies. You don't expand your company by throwing your loyal customers under the bus. Why doesn't the web clipper work? If one can guess anything in this fog of confusion, it's that Evernote does not consider its regular customers a priority. Based on following some of the discussions and links on this subject carefully, the correct information seems to be that Chrome itself was updated, and EN had to update its clipper functions to deal with this, and couldn't (or at least didn't) produce a completely functional version immediately, only a more-or-less functional one. This affects only the use of the Chrome browser (there are others). I've made some sweeping statements about Evernote's lack of concern for customers myself, but often enough the real issue is trying to keep all the plates spinning amongst multiple ever-changing operating environments. It's handy to blame Evernote, but sometimes they get sandbagged themselves. Sometimes, of course, they just blow it themselves. What happened remains in dispute. Some people here report being told that the rebuild had nothing to do with Chrome. The fact is, that several days out, Evernote Management has not deigned to communicate directly with its customers. It doesn't take long to draft a statement. Maybe it would have been uncomfortable, I don't know, IT'S THEIR JOB. If it were Chrome's fault, you'd think Evernote would have clarified that. Whatever the cause, customer reaction would have been better had Evernote come clean with us. At this point, it is on Evernote. It seems bent on eroding customer trust. This affects only the use of the Chrome browser (there are others). I know, but I use Chrome almost exclusively. It is awkward to open another browser just to save something and it slows down my computer. I agree 100% with this as regards the communication issue. (I was going to mention that in my post, but neglected to.) None of the problems in recent updates to the Windows and Android programs (the only ones I'm familiar with) has been as bad as the failure to let users know what's coming. Yeah, blaming it on Chrome or whatever might sound like whining, even though it wasn't. But saying nothing, especially when features disappear, leaves users to discover what look like random losses of functionality on their own. It really is alienating, and as you say it's incredibly easy to fix. The world is full of starving English majors looking for some way to make a living by writing something clear and straightforward. Interesting. I noticed the Clipper has changed recently, but in my use, it's working better than before. There was a page where updating the displayed content and re-clipping required pressing the Clipper launch button multiple times. Now it requires only a single press. I don't doubt that if I used the clipper in more varied ways, I'd encounter the issues described in this thread. I'd say that 90% of my time is spent with the web clipper, usually in Google Chrome, occasionally on my Android. Is anyone aware of a resolution to this issue? I am now running V7.2.1, and Clipper is still not working in Windows/Chrome (for the last month or so). The Clipper works fine in IE on the same machine. It's working fine for me now and has been for the past few weeks. Of course, now clipper for Gmail is broken. Perhaps try to see if there's an update for either? Simple advice but I didn't do anything to have mine operational again. This unsubstantiated rumor started by @gazumped seems to live on by those who choose to repeat the rumor. IMO, no one should state this rumor unless they have a referenceable quote from Evernote. I'm running Google Chrome 65.0.3325.181 (3325.181) on macOS 10.12.6. EN Chrome Clipper was working fine. This version had substantially few features than Ver 6.13.2, most notably it lost the "Remarks" field in the Clipper. When I reverted to EN Clipper 6.13.2, using the same version of Chrome, the Clipper and Chrome worked fine. I've not been using both for about 1 week without any issues what-so-ever. So, I do NOT see any evidence that Chrome broke the EN Clipper on the Mac. My thanks to those of you who down-voted my above post. Probably the same people who are passing on the rumors. But it is a good thing. It keeps my post at the bottom of the thread, where everyone will continue to see it. ? I reverted to Clipper 6.13.2 just a few days after the Ver 7 bad release, and I'm still there. Works fine. To close this out, the Clipper is finally working again for me in Chrome, under V7.3.0.360-2541bb85. Thanks to the folks who responded. It is still not working on Chrome. Useless, and I started to pay for your software. Now I think it is a mistake. Could not capture the page. n.indexOf is not a function. Based on following some of the discussions and links on this subject carefully, the correct information seems to be that Chrome itself was updated, and EN had to update its clipper functions to deal with this, and couldn't (or at least didn't) produce a completely functional version immediately, only a more-or-less functional one. What happened remains in dispute. Some people here report being told that the rebuild had nothing to do with Chrome. The fact is, that several days out, Evernote Management has not deigned to communicate directly with its customers.